Webster is a bundle of nerves headed into his first day of high school, but whatever academic and social horrors he feared are nothing compared to whats in store for him as he stumbles into an unsanctioned street level spelling bee! And this aint no staged production, either - letters fly like jump kicks and the losers leave bruised and beaten more often than not! Soon hes propelled into the fast-paced world of competitive spelling by the mysterious Outlaw King and his cohort the Black Queen. Does Webster have what it takes to get the spelling world buzzing? 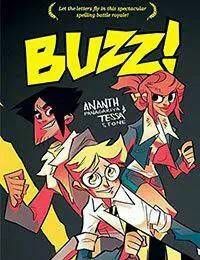 Find out in this word-based battle royale from web-sensations Ananth Panagariya (Johnny Wander) and Tessa Stone (Hanna is Not a Boys Name)!